Swimming is a total body workout and a great respite from the daily damage running and jumping can do to your body. Swimming should not be confused with an easy "phone-it-in" workout. It calls for some serious cardio conditioning and coordination. This year, add something new to your workout and start swimming for exercise. Here are some swimming tips to get you started. There are a number of reasons athletes head for the pool. Some are rehabbing injuries, while others are looking to switch up their workout. And then there are those who simply want to cool off. Whatever your reason, the benefits are just as good. Swimming is a total-body workout, engaging muscles that can be missed with other workouts. 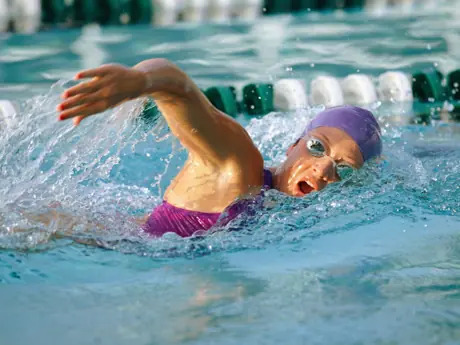 "Many people comment, 'I didn't even know I had a muscle there' after swimming for exercise," says Derek Howorth, swim coach and aquatics director for the George Block Aquatic Center in San Antonio, Texas. Howorth recommends easing into it to ensure you return. "Comfort is key," Howorth says. "If you are comfortable, you are more likely to try swimming again. So many people who try swimming for the first time start out at such a high effort level that they get tired after doing just a few laps." Get only the gear you need. Howorth cautions to keep it simple when selecting gear for your swim workout. "In swimming there are tons of 'toys' so don't get carried away," he says. "To start, you will need a proper training suit and goggles. If you need a little more motivation, get some fins." Fins can in fact help to motivate newer swimmers as they help to make your kick a little more effective and propel you forward with less effort, giving you more pool time to work on your stroke before exhaustion. More: Swim Junk: Beneficial or a Crutch? Nicole is a social media professional and writer. A long-time swimmer and a runner for the past 13 years, she thrives on all things endurance. She's a native New Englander living in California and loves the Patriots, the ocean and her dog.